Le Rouvray in Paris begins with a collection of 200 antique quilts and a selection of "early-American" furniture. In fact, the pine pieces are from England but the overall look is "Americana." Success with the press and the public is immediate. Soon, the American embassy in Paris contacts her. They ask her to lend a collection of thirty antique quilts for a cultural tour of France. The show travels to museums throughout France for two years. She often goes along, discovering places she hasn't visited before and carrying the quilting message, which is spreading like wildfire. Now, fourty-two years later, quilting is "on the map" in France. The English word "patchwork" has been adopted and describes anything from a political meating (patchwork of ideas) to a quilt. At Le Rouvray, we feature many classes, directed by top teachers. Our dynamic and multinational staff consists of dedicated quilters. A quilting thread that has found its way into someone's sandwich is a common occurrence at lunchtime. Hardly a day passes when we don't see an imaginative project made by a staff member or client. 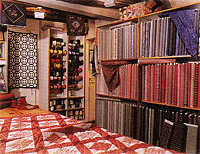 The shop is bursting with fabrics, supplies, and books. We would push the walls back if we could! Quilters visiting Paris usually find their way to Le Rouvray and we hope you will too. Please come to visit us soon. Even if you don't speak French, we speak Patchwork fluently! Standing, left to right: Viviane Martin-Schloesing, Joelle de Bailliencourt, Jeanne Chausson, Inès Travers, Christine Meynier, Soizik Labbens, Cosabeth Parriaud, Marie-Christine Flocard, Vanessa Gouju, Renée Gosse, Annick Huet, Willemke Vidinic, Marie-Paule Mariani. Sitting, left to right: Marie-Claude Gaillochet, Liesbeth Lafarge, Diane de Obaldia (shop owner), Jacqueline Billion.